New Year’s day feels like a good time to begin this work. As I chose the name, I thought about the incredible experiences I have had making my work, sharing with others, learning, and teaching. I will begin with some of the places I went and programs I participated in during 2014. An experience that was powerful and transformational for me was the International Expressive Arts Therapy Association (IEATA) regional conference in Antigua, Guatemala in February-March of last year. I was searching for ways to learn more about Multimodal Expressive Arts Practices and as Carl Jung might interpret the way I found the conference, by synchronicity I found the conference announcement on the IEATA webpage. With just enough frequent flier miles in my bank, I registered for the conference and the pre-conference workshop. The pre-conference workshop that was composed of visits to locations outside of Antigua that were relevant and important to Expressive Arts practices. 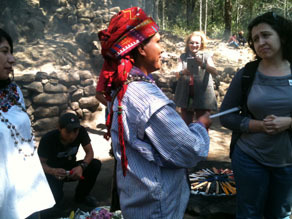 We first went to the ruins where a shaman from the Mayan community introduced us to rituals for blessing seeds before the planting season and also a ritual for cleansing. He taught us about the symbolism of the colors in the ritual and about ideas about relationships with other human beings, nature and Divinity. 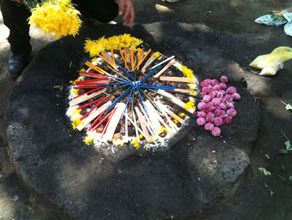 He offered a cleansing to all persons in the group who were experiencing illness or stress. 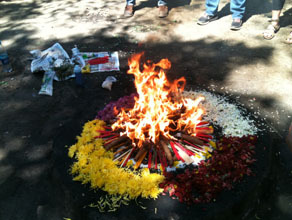 The smoke from lighted tobacco cigars was the element of purification. 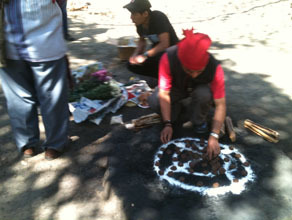 Following the cleansing, the cigars were placed on the fire where they were allowed to continue burning, consuming negative energies. and names of the days and the associated energies. At the site of the ball court, we learned about how the game was played with a heavy rubber ball and that the games lasted for days sometimes ending in death for participants. We learned that the course and movement of the game had metaphysical significance. The experiences of the day remind me of the importance of ritual, and how the incorporation of ritual into Expressive Arts psychotherapy practices creates culturally relevant, meaningful therapeutic interventions.